As word came out yesterday, that there will be NO Civil Rights case in the shooting death of the cop attacker Michael Brown in Ferguson, MO, we remind the American people that we have been asking the Holder Justice Department and the Civil Rights Division to look into civil and human rights violations in Indian Country for years. Read about those instances:One Death in Missouri.. and here in Eric Holder to Resign.. we included a letter to the Attorney General. What is it about Holder? Is he all flash and no substance? He got America all riled up thinking he would get a civil rights case against George Zimmerman too, after he won his self defense case in the death of his attacker Trayvon Martin. Another EPIC FAIL, ERIC. The failure was not in NOT finding civil rights abuses...but in trying to pull the wool over our eyes in saying that there were. 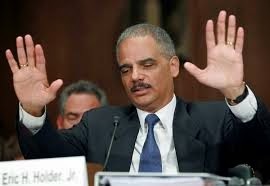 Just GO Mr. Holder, anyone is better than you. But again, here is a letter for your successor, since you are incapable. In some instances, the illegal actions occurred decades ago, however, there has been a marked increase since Indian Gaming has evolved into a multi-billion dollar business. Tribal leaders justify their right to systematically deny and/or strip basic rights and privilegesfrom their citizens under the guise of tribal sovereignty. The time is right for your department to use it's full force on the corruption that has spread throughout Indian Country.